The Clix base is big and clunky, whereas nice uniform 25mm black bases are smaller, more streamlined, and take up less space. If you’re already not using the Clix base for HeroClix, why have it at all? 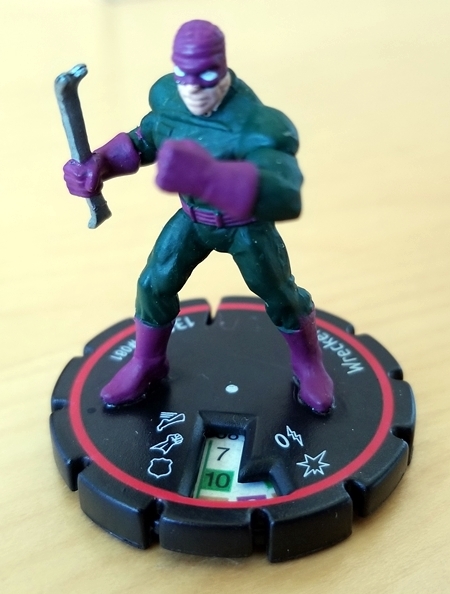 From repairing one of the minis that came in the bulk HeroClix lot I bought recently, I can confirm that even the ones whose little feet are attached directly to the Clix wheel (as opposed to being on a sort of micro-base atop the wheel) can be glued right back on, so gluing them to another base should be no big deal. Even if you skip Karl’s next steps — adding a texture and/or paint job to the new base, and then touching up the mini itself with highlights or other simple techniques — just swapping the bases looks like a dandy upgrade.